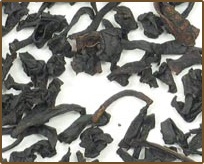 Loose tea samplers offer an easy way to explore a variety of teas. Each loose tea sampler contains about 1 oz each of four varieties of loose leaf tea in air tight tins, enough to brew about 8 - 10 cups. Note: Assortments may vary depending on availability. A wonderful introduction to our wide range of teas. Looking for a warm cozy feeling of sitting at the fireplace wrapped in a blanket. Try this tea with a touch of already warm milk and a dash of sugar/sweetner. It will warm your heart. Enjoy! 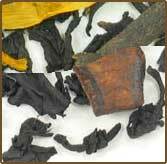 Premium black tea from Sri Lanka flavored with roasted chestnuts. Perfect for enjoying in front of an open fire. With Jack Frost nipping at your nose, this is the ideal time to enjoy this Holiday favorite. Help to make the season bright, give this limited-time tea a try. Depending on where you're from, you may either say "car-a-mel" or "CAR-mel." 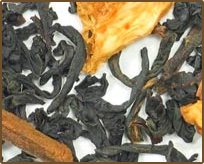 Any way you put it, though, this premium Ceylon black tea complemented with rich notes of caramel flavoring (that is sugar free!) is sure to have you saying, "wow! that's good!" To most Westerners, it is a little known fact that the word 'Chai' simply means 'tea' in Hindi. Therefore, all teas are technically chais. 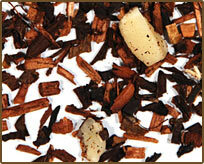 We offer a Masala Chai tea - premium Ceylon black tea with a unique blend of spices; cinnamon, cardamon, and ginger. 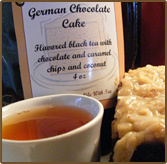 Flavored black tea with chocolate and caramel chips and coconut. 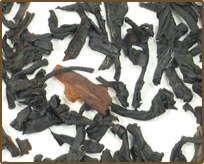 Premium black tea from China flavored with a spoonful of island rum. An intoxicating treat, delectable both hot and cold. If you like Amaretto or Bourbon tea and have yet to try gourmet rum tea, you'll be pleasantly surprised by its superior taste. Indulge your taste buds. Give our Rum Tea a try. 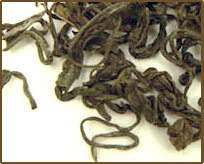 Premium white tea from Fujian region of China infused with the taste of ripe pears. A wonderfully smooth and subtle treat, delectable both hot and cold. 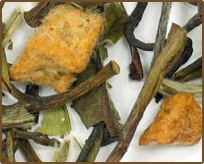 If you're new to white tea, this would be a good place to start. A whirlwind of fantastical flavor; taste the rich, dark chocolate in this blend of Ceylon and China blacks mingle with sweet, tart cherries. 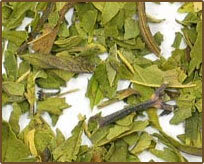 Dried peppermint leaves to make a minty, refreshing drink that is highly satisfying both hot and cold. A native of the Mediterranean, peppermint leaves were often used to crown luminaries in ancient Greece and Rome. It continues to be revered for its refreshingly light aroma, as well as its natural, caffeine-free taste. If you have yet to try gourmet peppermint tea, you'll be pleasantly surprised by its superior flavor. 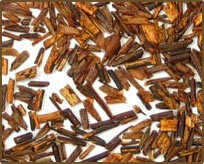 Super Grade Rooibos, Peppermint leaf and Chamomile packed with a variety of potential benefits. All three properties are thought to ease tension and stress and aid in easing the symptoms of digestive discomfort and nausea. A vivacious combination of cherry fruit flavor that is naturally caffeine free; a mouthwatering, sweet brew that is perfect hot or iced. Hazelnut is often paired with chocolates and other confections due to their sweet flavor, creating a decadent treat. This pairing of sweet honeybush and hazelnut is no exception. 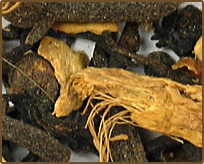 Enjoy this flavorful caffeine-free tea any time of the day!